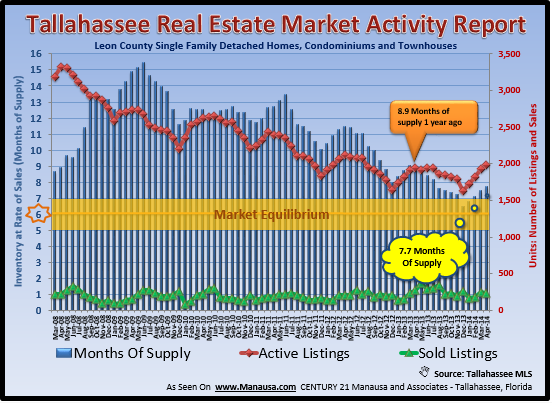 As we monitor supply and demand in the Tallahassee real estate market, we continue to see positive movement towards market equilibrium. 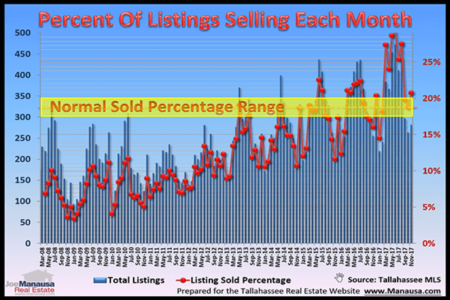 Long time readers of the Tallahassee Real Estate Blog can certainly attest that the quest for balance in our market has been a hot topic for more than six years. But even as we stand ready to achieve this goal, there are some important market factors that could well lead us back into the opposite direction. Will the positive trend continue, or will 2014 bring another sluggish year of the housing market recovery? We measure the supply and demand of homes for sale in Tallahassee by using information from the Tallahassee MLS. It's not as simple as taking a quick peak, we have to refine the information due to system inadequacies and human error. For example, many homes are listed more than 1 time by some agents, making the supply side look more prominent than it really is. NOTE: You can --> download the one-page "take it with you" supply and demand report by clicking this link <--. And some agents have sales entered into the MLS more than once, either through oversight or as an attempt to look more productive among their peers. But once we remove the duplicated information, we then conduct an analysis that produces the months of supply in each area and each price range for houses in Tallahassee. In the chart above, the "magic" number is 6.0. The six months supply of homes for sale in Tallahassee represents market equilibrium, that level of supply that puts sellers and buyers on even footing in a negotiation. Historically, Tallahassee has enjoyed 2 to 3% annual appreciation when the market was in balance. 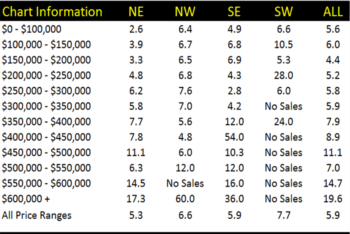 The far right column of the chart above shows that the market is improving very nicely for homes priced below $500,000. The following real estate graph shows the long-term trends for both supply and demand for houses in Leon County, Florida. The red squares show the number of houses on the market each month (measured on the right vertical axis) while the green triangles measure the number of homes sold each month (also measured on the right vertical axis). The blue bars (measured on the left vertical axis) show the resulting months of supply of homes. We refer to this as the "relative supply" of homes, meaning the amount of homes on the market relative to the current rate of demand. The information that we can derive from both the chart and graph above is good, but there are a few red flags that concern me. What will happen if a flood of sellers re-enters the market? The former will happen, the only question is when. 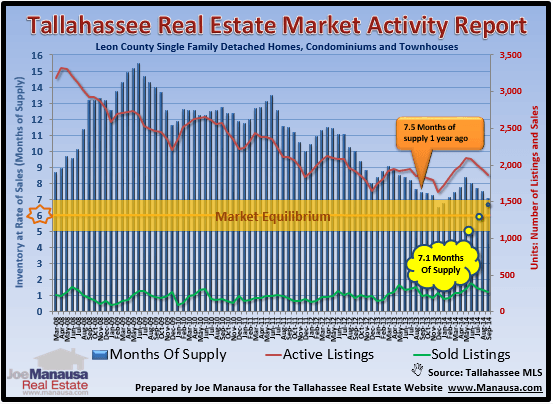 The latter might not happen, but we know that there is still more than a year's supply of homes in the shadow inventory, so the rate at which they re-enter the market will have a strong bearing on how the Tallahassee real estate market will behave in 2014 and beyond. If you would like to know more about the supply and demand for homes like yours, just drop me a note and we can schedule a time to review your home and provide the information that you need.